You may stop the slide show at any time by holding your mouse on a photo. 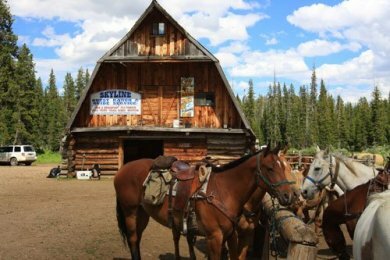 All trail rides begin and end at the hitching post in front of Skyline's rustic three-story barn. Your guide will lead you at a brisk walking pace along the trails which cross the Clark's Fork River, meander among guardian pines, and traverse the varying terrain that make up this beautiful area. Breathtaking scenery is all around, keep your eyes open for wildlife! 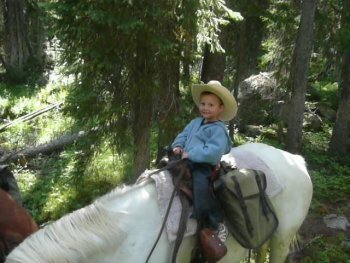 Our strong and gentle horses are well-suited to care for you as you explore the Gallatin National Forest and the Absaroka-Beartooth Wilderness. We have horses for all types of riders, from novice to seasoned horsemen. Come enjoy this true "wild west" adventure with us! We are an equal opportunity service provider but children must be big enough and brave enough to ride their own horse, no double riding is allowed. Please do not ask to ride if you are pregnant or intoxicated. Some weight restrictions may apply. We operate under permit of the Gallatin National Forest. Book Trail Rides! Trail rides are available from 8 a.m. to 6 p.m. Monday through Saturday, closed on Sundays. Reservations may be made in advance, subject to availability but no cancellation allowed within 48 hours of the scheduled ride, late cancellations and no-shows will be charged in full. Trail ride availability may be sketchy after Labor Day.